Calderdale Clinical Commissioning Group’s Head of Service Improvement Debbie Graham has said that Todmorden Health Centre belongs to the people of Todmorden. In fact, it belongs to a Real Estate Investment Trust (REIT) called Assura Group Ltd.
And Calderdale Clinical Commissioning Group (CCG) has hired a commercial property development company, BIlfinger GVA, to work out how to bring in new tenants to fill all the unused spaces in Todmorden Health Centre and make it work as the “hub” for the Vanguard/Care Closer to Home scheme. This aims to cut acute and emergency hospital services and replace them with care in the community for frail elderly people and people with chronic illnesses. As a Real Estate Investment Trust, Assura Group Ltd has to distribute 90% of its income to investors. It also means it has reduced liability for corporate tax. In other words they are bleeding profits out of the NHS that if the health centre had been publicly funded, would stay within the NHS. Tod Health Centre was initially planned as a Health Centre for the 8GPs in the Todmorden Group Practice, together with “enhanced Primary Care Trust services”, Dentistry, Pharmacy, and Acute Trust Outpatient services. It cost Assura £10.3 million. Assura gained planning permission from Calderdale MBC in 2007. Tod Health Centre opened in 2008. Assura had to add space in Tod Health Centre for an additional, privatised GP practice. This was to accommodate a Darzi centre contract with private provider Care UK. But Care UK only honoured its contract for two years, before making a ‘mutual agreement’ with Calderdale Primary Care Trust, to terminate it in 2011. Calderdale Clinical Commissioning Group (CCG) controls over half of the floor space in the building. Either NHS England or NHS Property Services pays the CCG’s rent to the landlord, as far as I can make out from a rather evasive reply from Calderdale CCG to my question about the rent. But much of this space is unused or underused. The whole operations unit is unused, because the CCG can’t get doctors and other NHS staff to go there, and the dental area is under-used. The under-used and unused areas are shown in this slide from Bilfinger GVA, within the red lines. On 30th November this year, Bilfinger GVA held a workshop with Upper Calder Valley voluntary groups that are affiliated to Voluntary Action Calderdale. Bilfinger GVA apparently reckons Assura may well be unimpressed too, since their Strengths/Weaknesses/Opportunities/Threats (SWOT) analysis identifies that a threat is landlord buy in to using the Tod Health Centre as a care closer to home “hub” with community groups using the space. I asked the 10 December Calderdale Clinical Commissioning Group Governing Body meeting the following questions, which they refused to answer but said they would treat as FoI requests – which means they can take up to 20 working days to reply. How long are the Todmorden Health Centre leases with Assura? How much rent does Calderdale CCG pay to Assura each year? 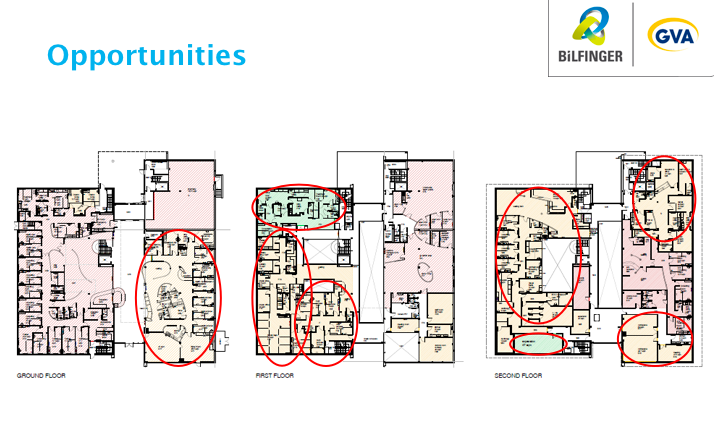 Why does Bilfinger GVA’ SWOT analysis consider landlord buy in a threat to proposals to use Todmorden Health Centre as a site for Care Closer to Home? “We do not hold this information as it comes under the responsibility of NHS England and NHS Property Services. The Chief Officer of Calderdale CCG has spoken to NHS England who have advised that this will need to be treated by them as a Freedom of Information request. 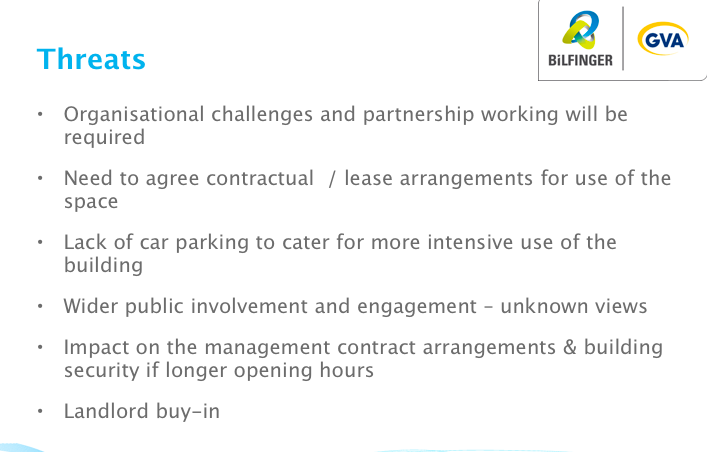 The Clinical Commissioning Group is to do “public engagement” on the Bilfinger GVA report in February 2016. The driving force behind the development of the over-sized Tod Health Centre was the New Labour Darzi clinics programme – named after Lord Darzi, an adviser to the New Labour government. Darzi clinics, aka Independent Sector Treatment Centres, were an attempt to open up the NHS to private health companies by contracting with them on very expensive terms, to carry out high volume, low complexity, planned care/elective treatments. The Darzi clinics scheme quickly fell through because it was such a costly privatisation rip off and provided such poor health care. The investigation shows the centres – rolled out in every PCT under the directive of former Labour health minister Lord Ara Darzi – but branded expensive white elephants by GP leaders – are increasingly being targeted for closure as cash-strapped PCTs try to bring their finances under control. Locala now has the contract for the “Community Practices” in Todmorden and Park Ward, Halifax, after Care UK handed it back. These “Community Practices” were set up as a result of the New Labour Practice Plus scheme, which required additional GP-led health centres to be opened in areas where there were not enough GPs for the population, and was designed to open GP services to private healthcare companies such as Virgin Care. The Upper Calder Valley Vanguard/Care Closer to Home scheme looks like a desperate attempt to breathe life into the Darzi Clinic zombie, that has been sucking money out of the NHS in Calderdale for years, as Calderdale CCG pays rent to Assura for space it isn’t using. The answer lies in the hospital doing more in the community. We can save money and make it better – that’s the big challenge for the NHS. We want the NHS to become more preventative, efficient and people-centred and we can do all those things at the same time. This entry was posted in Social fairness and tagged Bilfinger GVA, Calderdale MCP Vanguard, Care Closer to Home by jenny. Bookmark the permalink.